One of the top Bluegrass bands in America! From the very beginning of their partnership in late 2007, Jamie Dailey and Darrin Vincent quickly established themselves as fresh voices in their genre. The concoction of their fantastically powerful vocal blends, 4 award-winning studio albums, and heavy touring schedules has gained them well-deserved attention from bluegrass, country, and gospel critics and fans alike. 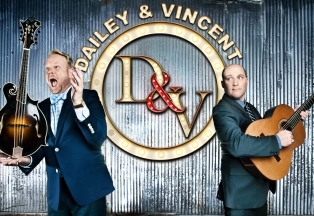 Dailey & Vincent has been recognized as 3-time IBMA Entertainer of The Year, 3-time IBMA Vocal Group of the Year, 2-time Grammy nominee, and Dove Award winners. Equally at home with material from any of the aforementioned genres, Jamie and Darrin continue to expand on the possibilities of what kinds of music can become “Dailey & Vincent" music.